2. Heat marshmallows and butter in a large saucepan over low heat until melted and smooth. 3. Stir in several drops of food coloring. 4. Pour over popcorn and candy, tossing to coat evenly. 5. Grease hands and form into 3-inch balls. Place 1-3 pieces of candy corn at the end of each finger (depending on size of glove), pointy side first, to make fingernails. 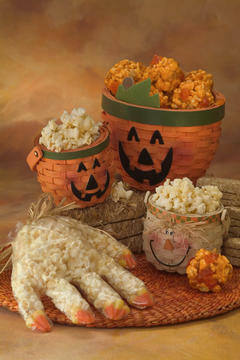 Fill the glove with popcorn and tie it off with ribbon or yarn.